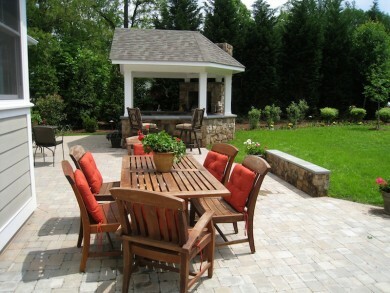 For patio designs with the right aesthetic and layout, look to O’Grady’s Landscape. Serving homeowners throughout Northern Virginia, we strive to create patios with one-of-a-kind beauty and functionality, tailoring our designs to the surrounding landscape and the unique needs of each client. Specializing in paver and stone patio designs, we want to help you achieve your goals for the picture-perfect landscape with places for entertaining, relaxing, and grilling with the family. Your patio is at the heart of your outdoor living space, so you can rest assured we’ll approach your project with thoughtful designs and careful craftsmanship. To schedule your consultation for patio installation in Great Falls, the City of Falls Church, McLean, Vienna, or North Arlington, contact us today at 703-533-5001. For extensive space and the perfect outdoor entertainment design, we recommend our tiered patio designs. Our landscape designers will be happy to walk you through the selection process and answer any specific questions you may have during your initial consultation. At O’Grady’s Landscape, we take pride in our patio designs, helping clients from Great Falls to North Arlington achieve their goals for the perfect outdoor living space. Whether that means providing a space to lounge by the pool or a spacious area for outdoor entertainment, we’ve got your needs covered. Our main objective is to complete each patio installation project as you envisioned, and we always strive to offer timely customer service and excellent project management. Dazzle your guests with a new patio by O’Grady’s Landscape—call today at 703-533-5001 for an estimate on patio designs in Northern Virginia!